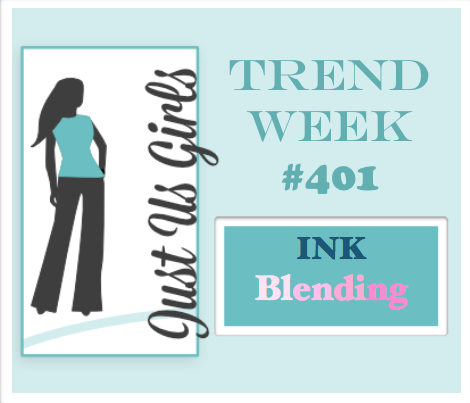 Hello Friends, I am hosting this week at Just Us Girls and the Trend I picked out for you this week is Ink Blending. It’s a trend that has been around for quite sometime now and I believe will not be going away any time soon. Especially with the new Oxide Inks which I have used here. Please come on over and check out what my fabulous team has done along with our guest Aileen Ryan! *Supplies- Sun die is Lawn Fawn, Sentiment is Raspberry Suite, fun sun bursts are Verve, Rectangle dies are MFT, circle die is SU, Oxide inks and Embossing powder. Categories: Cards | Tags: Card making, Cards, Distress inks, emboss resist techinique, friendship, rubber stamps, stamping, Thinking of you | Permalink. Your soft yellows are so pretty! I love the new Distress Oxide Inks too, but you have really done an outstanding job with blending the pink and yellow. It looks just like a sun rise on a special day. Going to try this color combo today. Thanks for the motivation. 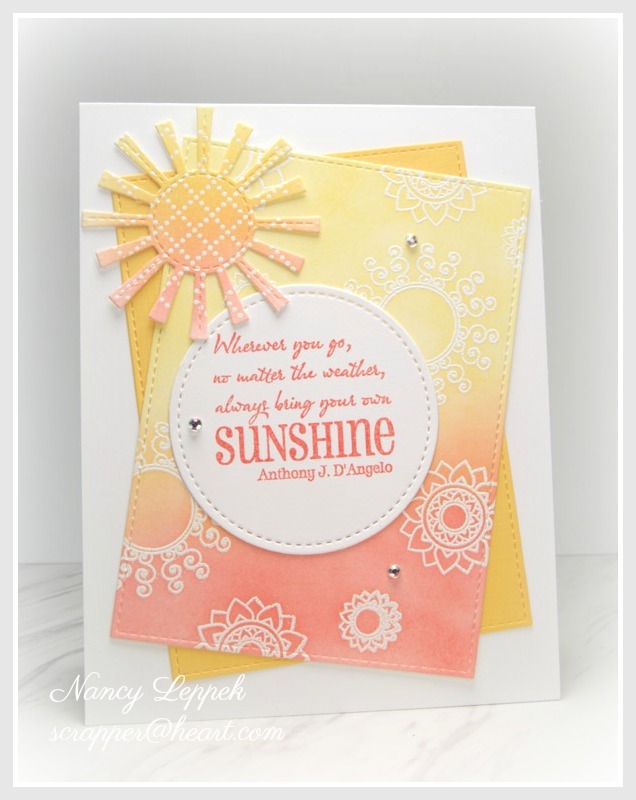 You truly brought the sunshine to your card with that wonderful ink blending, Nancy. I love the tilted panels and that darling patterned sun. Fabulous job of ink blending and the end results is stunning! I love the soft colors and beautiful card. Great trend to showcase! So pretty- love your blending of these soft colors and love that pattern on the sun! Such a happy card! Beautiful card. Love the colors and your ink blending. I just got some oxide inks and am anxious to give them a try. Oh, I love this Nancy. So soft and beautiful. Looks like you have a great Anniversary vacation. I love everything about this card, the design, colors and that soft blending….absolutely beautiful! Gotta get me those oxide inks when they blend as beautifully as your has. Love the soft colours you chose Nancy. Beautiful all over and that sentiment is perfect. Super fun card. Love those blended pastel colors. Great layout. This is awesome! I love the soft colors of your blended inks. I really like that blended sun and all of the fun background images, too. Beautifully blended background! I stink at blending, lol! Love, love, love the soft colors here. And that sun is the BOMB!!! Great texture on him! I’m also such a big fan of white heat embossing and then sponging, your example is just STELLAR!!!!! Nancy this beautiful card!! makes me hungry for a “Dreamsicle”!! yummy : ) so gorgeous! What a bright sunny card! Thanks for this great challenge!